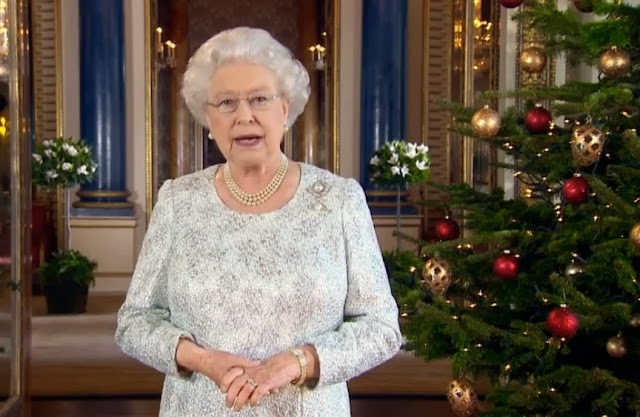 For the past half century, televisions have been turned on at three o'clock in the afternoon on Christmas Day for Queen Elizabeth II's annual Christmas message. Most of the broadcasts are filmed at one of the royal palaces, and almost all of them include footage of the Queen's activities over the year mixed in with statements encouraging people throughout the Commonwealth to reflect on the meaning of Christmas. Many of the broadcasts are available to watch on YouTube, and Wikipedia also has a handy outline that covers the content of each message, from George V's first radio-aired message in 1932 (written by Rudyard Kipling), all the way to the 2012 message, which was the first to be broadcast in 3D. But today, we're going to spend a little time talking about the sparkly part of this annual tradition: the brooches that the Queen wears while delivering her speech. At the start of her reign, the Queen went brooch-less for the broadcast. For her first televised Christmas message, she chose one of her signature three-stranded pearl necklaces  and a shiny dress that sparkled on its own. But as years went on, the brooches that have become a regular part of her daytime jewelry rotation began to pop up with strands of pearls in the Christmas broadcast, too. One of the brooches that shows up frequently on the Queen during these broadcasts is the Pearl Quatrefoil Brooch (also sometimes called the "pearl trefoil brooch"). Unlike lots of the other brooches in her collection, this one was apparently not inherited from another member of the family. 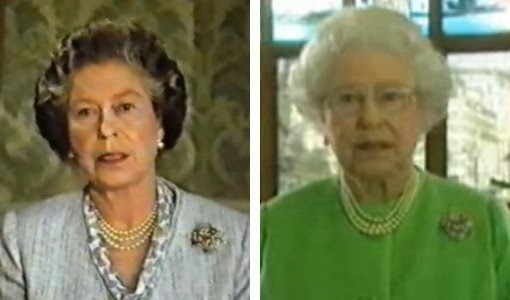 Leslie Field notes that the Queen first sported the brooch in the middle years of the 1980s , and indeed, she wore the brooch for her Christmas broadcasts in 1985, 1992, 1997, and 2000. For one of her broadcasts in the 1980s, the Queen paired a bright blue dress with one of the most important brooches in the royal collection: the Prince Albert Brooch . This brooch, made of a large, faceted sapphire surrounded by twelve round diamonds, dates to the 1840s. It was Prince Albert's wedding gift to his bride, Queen Victoria, who treasured the piece and designated it as an heirloom of the crown. It has been worn by all subsequent British queens, including Elizabeth II on this occasion in 1987. Another heirloom sapphire brooch that has appeared on one of the Christmas broadcasts is Empress Marie Feodorovna's Sapphire Brooch, a piece that Queen Mary purchased from the estate of the late empress in 1930 . The brooch was an especially good candidate to return to Britain, as it was given to Marie Feodorovna (who was born Princess Dagmar of Denmark) as a wedding present in 1866 by her sister and brother-in-law, the Prince and Princess of Wales (later King Edward VII and Queen Alexandra). Like the Albert brooch, this piece features a sapphire ringed with diamonds; however, this brooch has a cabochon sapphire set in its center, and it includes a drop pearl. An example of a brooch that has been worn in more than one broadcast over the course of decades is the Flower Basket Brooch, which is reported to be one of the Queen's favorites . The colorful brooch was a gift from her parents, King George VI and Queen Elizabeth, in November 1948 to mark the birth of Prince Charles. The then-princess wore the brooch for her son's first official photograph, and she has continued to wear it over the years. An especially appropriate choice for Christmas is the Jardine Star Brooch, which the Queen has worn twice during her Christmas message. 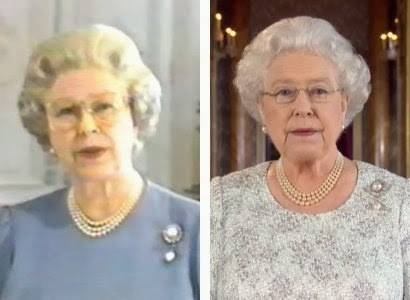 The Queen inherited the diamond star brooch from Lady Jardine in 1981 , and she put it to use quickly, wearing it for her Christmas broadcast in 1982 and then again in 1995. One of the queen's most famous brooches has made very few Christmas broadcast appearances. The Williamson Diamond Brooch contains one of the most valuable diamonds in the world: the pink diamond given to Elizabeth as a wedding present by John Williamson . The Cartier brooch was designed around the Williamson diamond and was completed in 1952. 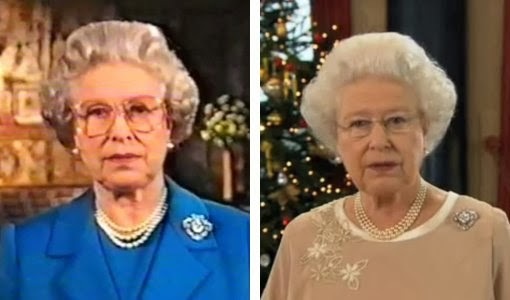 The queen most recently chose the Williamson brooch for her 1998 Christmas broadcast. Another brooch that has appeared only once in recent Christmas broadcasts is Queen Victoria's Pearl Brooch . Made of eight pearls set in diamonds, with three more drop pearls suspended from the central element, the brooch should have passed to the Queen upon her accession in 1952. But as was the case with so many pieces, it was retained instead by the Queen Mother, who wore it up until her death in 2002. The Queen inherited the brooch with the majority of the rest of the Queen Mother's jewelry, and she wore it for her Christmas message in 2009. The brooch chosen by the Queen for her 2011 Christmas broadcast, which featured footage of two of her grandchildren's weddings, was one that she has had since she was a princess: the Flame Lily Brooch . It was a present from the children of Rhodesia (now Zimbabwe) to mark her twenty-first birthday in 1947. She memorably chose this brooch to wear as she arrived in Britain after unexpectedly ascending to the throne during a visit to Kenya. Today, the Queen actually owns a second brooch of the same design, which she inherited from her mother in 2002. While many brooches from the Queen's collection have made only fleeting appearances in her televised messages, the Duchess of Cambridge's Pendant Brooch has appeared at least four times . This brooch is a family heirloom with a long history. It originally belonged to Queen Mary's grandmother, the Duchess of Cambridge, and was one of Mary's most-worn brooches. She wore it on important occasions, including the christenings of the present queen and of Prince Charles. 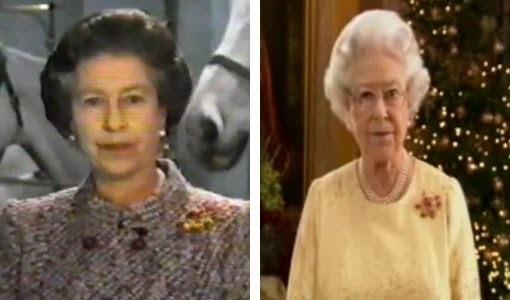 The Queen inherited the brooch from her grandmother in 1953, and she has worn it for Christmas broadcasts in 1971, 1978, 1996, and 2012. Right up there with the Cambridge brooch in terms of frequent Christmas broadcast appearances is one of the most important brooches in the royal collection: the Cullinan V Brooch, made from one of the stones cut from the enormous Cullinan diamond . The Cullinan V is the heart-shaped diamond from the set, and the brooch also features additional diamonds set in platinum. 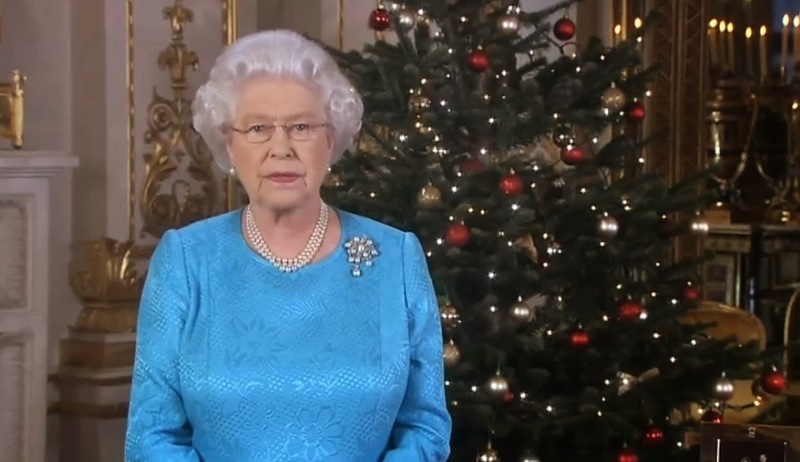 The Queen has worn the Cullinan V Brooch for no less than four of her Christmas broadcasts, including the messages from 1975, 1981, 1999, and 2008. While you watch the Queen's broadcast tomorrow, keep your eyes peeled to see whether she chooses to repeat one of these brooches or selects a completely different one for the occasion. In the meantime, you can catch up on previous Christmas messages with this YouTube playlist . 1. 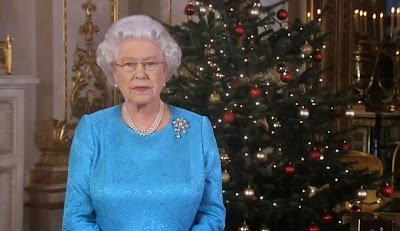 Cropped still from a YouTube video of the Queen's 2012 Christmas broadcast; source here. 2. 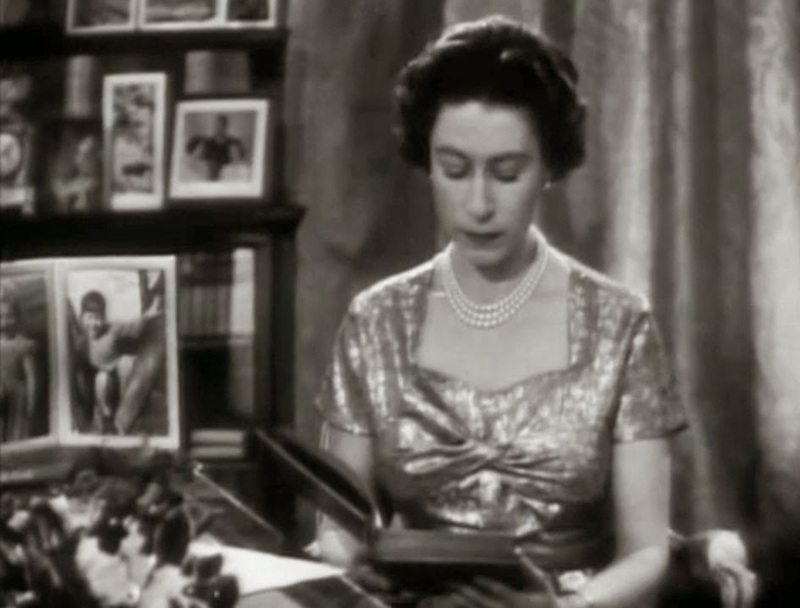 Cropped still from a YouTube video of the Queen's 1957 Christmas broadcast; source here. 3. In The Queen's Jewels, Leslie Field notes that the Queen has three different three-strand pearl necklaces: "One is of graduated pearls from the family collection, which the Queen had made up with a diamond clasp soon after her accession. The second triple-row necklace was a Coronation present to the Queen in 1953 from the Amir of Qatar. It too has a clasp of brilliant-cut diamonds. The third was a gift from King George to celebrate his Silver Jubilee" (pg. 101). 4. 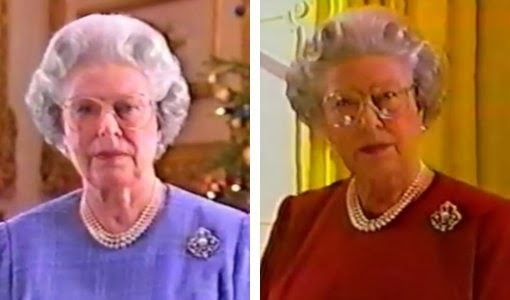 Cropped still from a YouTube video of the Queen's 1997 Christmas broadcast; source here. 5. Cropped still from a YouTube video of the Queen's 2000 Christmas broadcast; source here. 6. Field states that this brooch is "a large diamond quatrefoil set with pearls having a pearl and diamond cluster in the centre," and that the piece was "first seen in the mid-1980s" (pg. 112). 7. 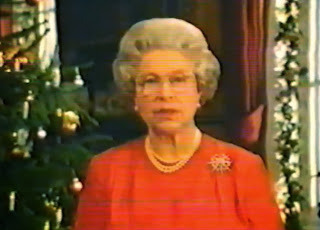 Cropped still from a YouTube video of the Queen's 1987 Christmas broadcast; source here. 8. See the Royal Collection website, as well as Field, pg. 150. In The Royal Jewels, Suzy Menkes notes that there are multiple copies of the brooch in existence: "Prince Albert made copies of the brooch for his own daughters, and the Queen has given one of these to the Princess Royal" (pg. 9). She states further, "The Princess Royal wears one of the copies of Queen Victoria's brooch that Prince Albert had made for his elder daughters. When one came on the market, the Queen bought it back for her own daughter" (pg. 156). 9. 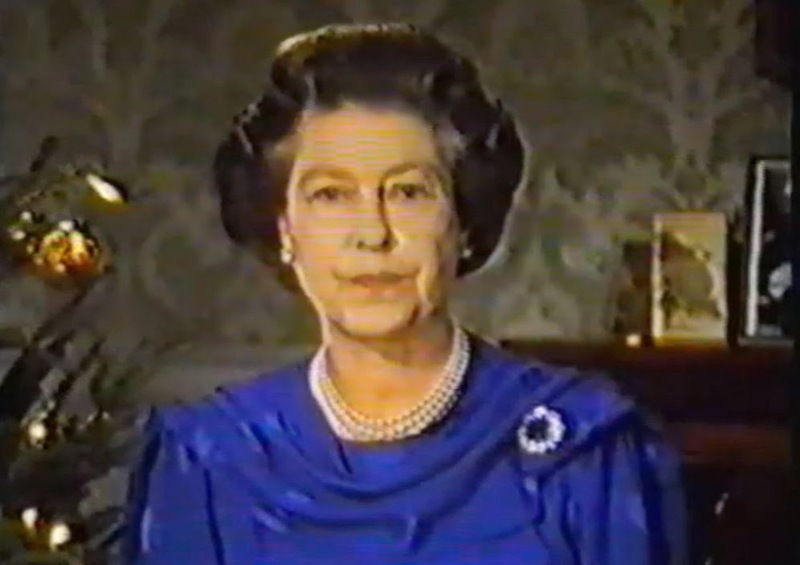 Cropped still from a YouTube video of the Queen's 1994 Christmas broadcast; source here. 10. See Field, pg. 153. While Field states that the brooch was purchased in 1929, the inventory of Marie Feodorovna's jewels sold by Hennell notes that the piece was bought by Queen Mary on 3 Oct 1930. The list is available here on Ursula's website; the brooch is item #42 and described as a "brooch w/oval cabochon sapphire surrounded by diamonds & pear-shaped pearl." 11. 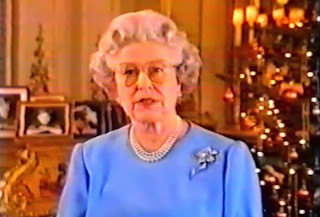 Cropped still from a YouTube video of the Queen's 1988 Christmas broadcast; source here. 12. Cropped still from a YouTube video of the Queen's 2006 Christmas broadcast; source here. 13. See Field, pg. 60. 14. Cropped still from a YouTube video of the Queen's 1986 Christmas broadcast; source here. 15. Cropped still from a YouTube video of the Queen's 2007 Christmas broadcast; source here. 16. Field notes, "Since her marriage in 1947 the Queen has been given six brooches of varying design set with rubies and diamonds. She wore one of these, a modern gold free-form shape, set with seven carved rubies, for her 1986 Christmas television broadcast to the Commonwealth" (pg. 138). Grima Jewellery often publishes photos on its website of the Queen wearing this brooch at various engagements (for example, her historic state visit to Ireland in May 2011). 17. Andrew Grima died 26 Dec 2007; see his obituary on the Guardian website. 18. 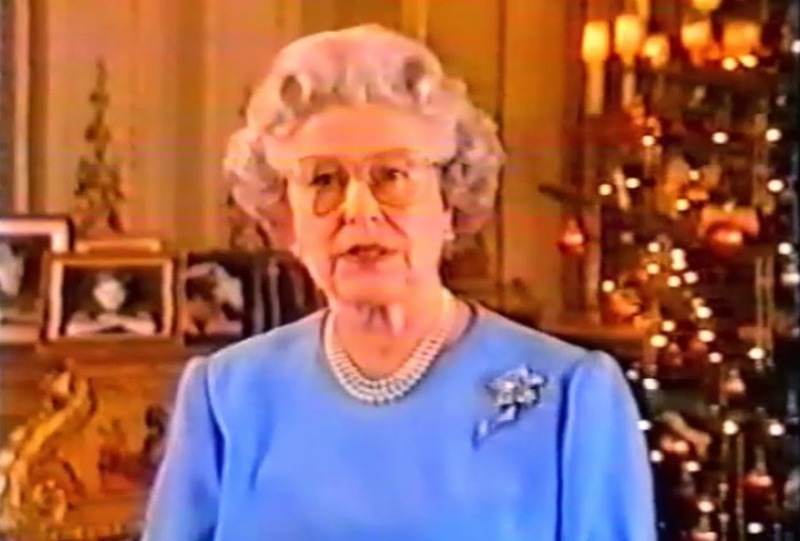 Cropped still from a YouTube video of the Queen's 1995 Christmas broadcast; source here. 19. Field states, "In 1981 the Queen was left a late-Victorian diamond star brooch by Lady Jardine, which she has worn on many occasions. It has a collet diamond on a knife-wire between each of its eight points" (pg. 34). 20. 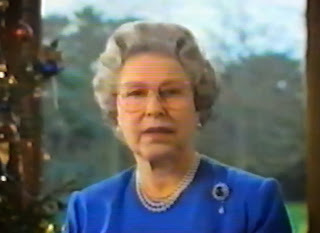 Cropped still from a YouTube video of the Queen's 1998 Christmas broadcast; source here. 21. In The Queen's Diamonds, Hugh Roberts states, "Dr Williamson presented the diamond (uncut and weighing 54.5 metric carats) to Princess Elizabeth" (pg. 294). See also Field, pg. 102, and the Royal Collection website. 22. 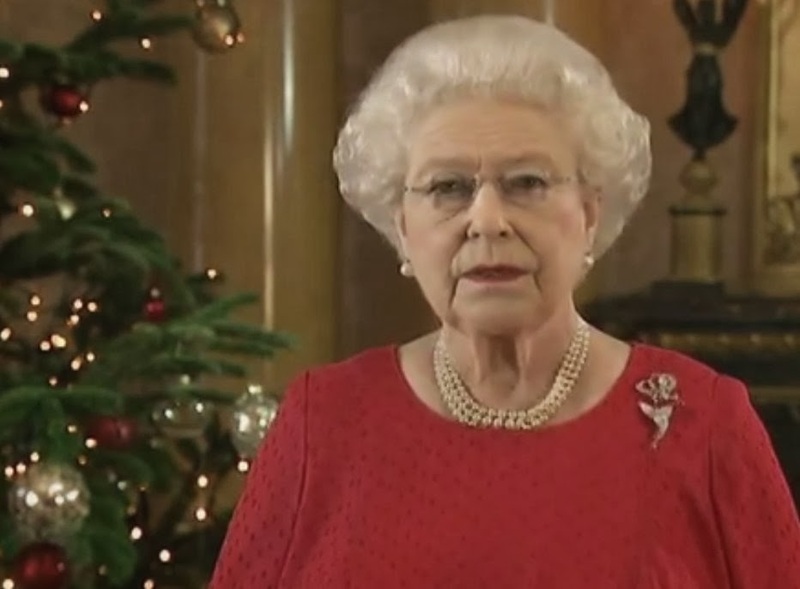 Cropped still from a YouTube video of the Queen's 2009 Christmas broadcast; source here. 23. Like the Albert brooch, this brooch is an heirloom of the Crown. Field notes, "Another brooch that Queen Victoria left to the Crown was a large diamond-shaped design set with numerous diamonds, eight pearls and three pendant pearl drops. Queen Elizabeth the Queen Mother wore this a great deal in the 1950s but it has not been seen for many years" (pg. 110). The Queen Mother was seen wearing the brooch in the years following the 1987 publication of Field's book; see the photographs here at the Royal Jewels of the World Message Board. 24. Cropped still from a YouTube video of the Queen's 2011 Christmas broadcast; source here. 25. See Roberts, pg. 268; Field, pg. 33; and the Royal Collection website. 26. 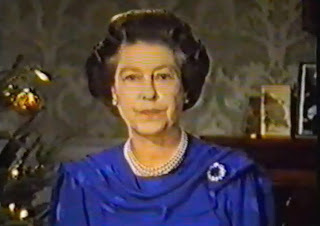 Cropped still from a YouTube video of the Queen's 1996 Christmas broadcast; source here. 27. Cropped still from a YouTube video of the Queen's 2012 Christmas broadcast; source here. 28. See Roberts, pg. 118, and Field, pg. 133. 29. Cropped still from a YouTube video of the Queen's 1999 Christmas broadcast; source here. 30. Cropped still from a YouTube video of the Queen's 2008 Christmas broadcast; source here. 31. See Roberts, pg. 164; Field, pg. 76; and the Royal Collection website. 32. For even more photographs and information about the Queen's Christmas broadcasts over the year, see this 2012 article on the Daily Mail website and this thread from the Alexander Palace Time Machine Discussion Forum.